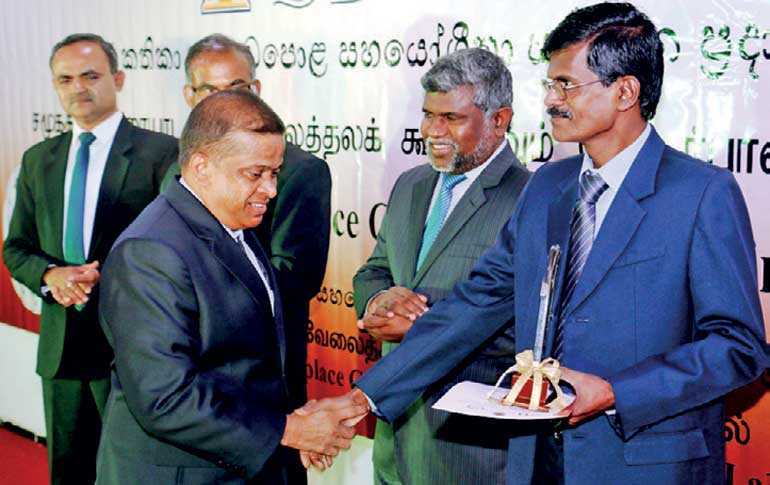 One of the well-known manufacturers of high quality tea in Sri Lanka, Lucky Kottawa Tea Factory received an award of National Excellence in Small Scale, Manufacturing Sector, National Level at Social Dialog &Workplace Cooperation Awards 2018 organised by the Social Dialog & Workplace Cooperation Unit, Human Resource Development Division, Department of Labour,Ministry of Labour. The grand award ceremony was held in Colombo recently. Sound working environment is necessary for achieving financial targets while workplace cooperation is helpful to strengthen employer-employee relationships.Implementing social dialogue practices within the organisation, enables accomplishment of production targets and improves relationships between employer and employees. The award winners at this ceremony are those who excelled in social dialogue and workplacecooperation. Commenting on the receipt of the prestigious award, Lucky Kottawa Tea Factory Chairman Lakshman Gamage said it is a testimony to the amicable relationship the company has built up among the management and workers. According to Gamage, Lucky Kottawa Factory could meet the criteria of being the service provider to a maximum number of customers and the production of quality, sublime tea within just three years since its inception. Lucky Kottwa Tea factory manufactures about 160,000 kilograms of tea leaf to produce about 32,000 kg of tea. They collaborate with around one thousand small scale tea manufacturers.They purchase tea leaf from these traders without intermediaries by using their own transport so that they benefit the very traders with the saved profit, which is a speciality as Gamage says. The factory operates a welfare union representing all the estate owners and is engineered to issue educational scholars for their children and emergency and funeral donations. Lucky Hiniduma, Lucky Meegahathanna, Lucky Pinnaduwa, Lucky Weerapana are the other branches which cover around 7,600 of small scale estate owners.